The Family From One End Street and Some of Their Adventures by Eve Garnett ~ 1937. This edition: Frederick Muller, 1949. Illustrated by the author. Hardcover. 212 pages. A cheerful period piece of a book, illustrated by the author. Mrs. Ruggles was a Washerwoman and her husband was a Dustman. “Very suitable, too,” she would say, though whether this referred to Mr. Ruggles himself, or to the fact that they both, so to speak, cleaned up after other people, it was hard to decide…There were a great many Ruggles children – boys and girls, and a baby that was really a boy but didn’t count either way yet. The seven Ruggles children, from twelve year old Lily Rose doorstepping down through Kate, twins James and John, Josiah (after his father, and both called “Jo” for everyday), Margaret Rosie, and baby William, get into the expected scrapes, and find their way out of them in various ingenious ways. Anecdotal chapters follow the children in turn, and together give an amusing portrait of between-the-wars London through the eyes of a poor-but-respectable working class family. Homeschooler “living books” note: Much in the line of Eleanor Estes and Elizabeth Enright, this might well work as a read-aloud to attentive children, or as a good read-alone for thoughtful and competent middle grade and older readers, if they are interested in “family stories” from “long ago.” Nicely complex in structure and vocabulary; developing early readers might have some trouble deciphering some of it, but confident readers should be able to power through. Charming and diverting, for the problems are quite genuine, the adventures are sometimes poignant (and also frequently quite funny), and they always seem to come right in the end. Pleasant adult read for its historical interest and distinctive narrative voice. I’ll repeat: this is definitely a period piece. Garnett was commissioned to illustrate Evelyn Sharp’s 1927 book The London Child and the work left her “appalled by conditions prevailing in the poorer quarters of the world’s richest city”. She determined to show up some of the evils of poverty and extreme class division in the United Kingdom, especially in contemporary London. To that end she worked on a 40-foot mural at the Children’s House in Bow, completed a book of drawings with commentary called Is It Well With The Child? 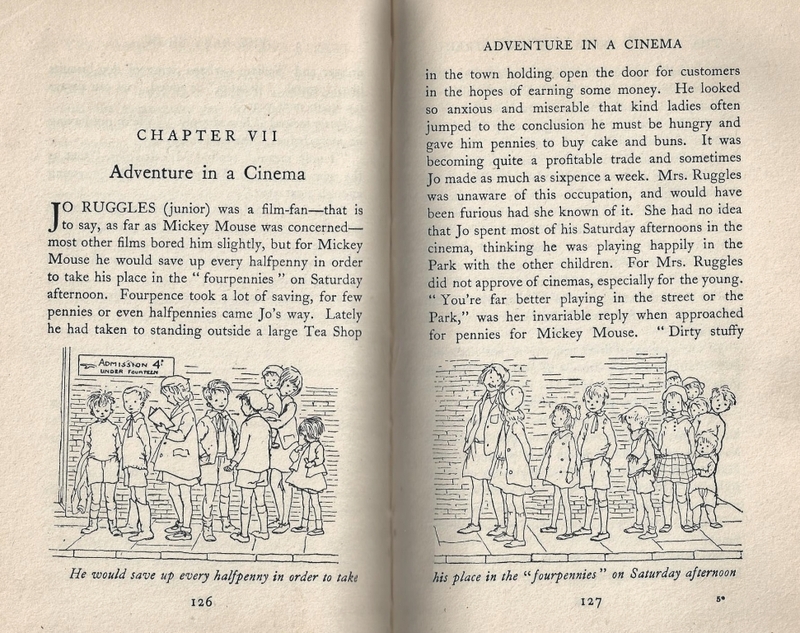 (1938), and both wrote and illustrated a story book that dealt with the social conditions of the English working class, which was exceptional in children’s literature. 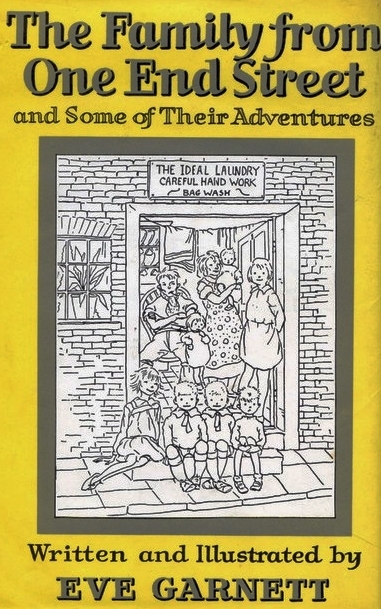 That book, The Family from One End Street, was rejected by several publishers who deemed it “not suitable for the young”, but eventually published by Frederick Muller in 1937. It won the second annual Carnegie Medal from the Library Association, recognising the year’s outstanding children’s book by a British subject. (It beat Tolkien’s The Hobbit among others.) For the 70th anniversary of the Medal, it was named one of the top ten Medal-winning works, selected by a panel to compose the ballot for a public election of the all-time favourite. It is regarded as a classic, having remained in print to the present day. A random page scan from The Family From One End Street, by Eve Garnett, 1937. 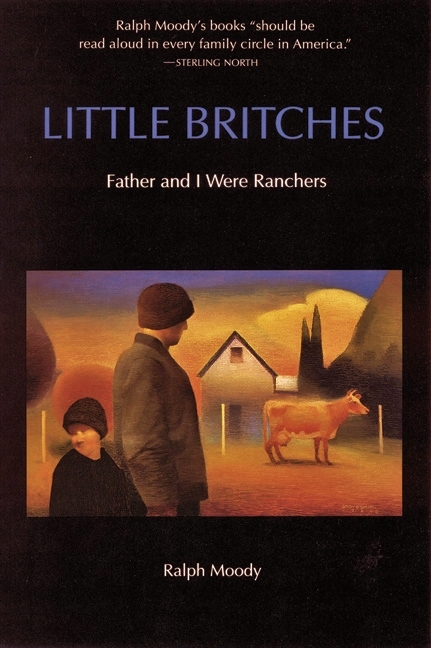 Little Britches: Father and I Were Ranchers by Ralph Moody ~ 1950. This edition: University of Nebraska Press, 1991. Softcover. ISBN: 0-8302-8178-1. 260 pages. In 1906 the Moody family – Mother, Father, and five children, with Ralph the second oldest at 8 years old – moved from New Hampshire to Colorado, where it was hoped that the clean air and a healthy outdoor life would help Father recover from a lung ailment acquired while working in a dusty woolen mill. This turns out to be galloping tuberculosis, and you just know it’s not going to end well, especially when you note that the sequel to Little Britches is titled Man of the Family. Gloomy foreboding aside, I’ll return to the installment under discussion. Promised a thriving ranch, the family finds instead a derelict three-room house set on skids in the middle of a cactus-infested field, with not a decent fence or sound outbuilding in sight. They almost head back to New Hampshire then and there, until Mother proclaims, with a sob in her voice, that the Good Lord led them there, and there they shall remain. Needless to say there are many challenges, but a small and thriving ranch is indeed established, with young Ralph, in the throes of hero worship for the local cowboys he has just encountered, participating to his utmost alongside his competent and hardworking through constantly ailing father. A diverting enough tale, mostly autobiographical, with some creative license applied by the author. Young Ralph seems to have been a rather accomplished child for an 8-year-old; he excels at everything he tries, though frequently not without a lesson-teaching setback or two. Father is continually having to spank him soundly, and of course (this being an inspirational type tale), young Ralph is grateful for his correction, for naturally Mother and Father know best. Sometimes a bit preachy, but nevertheless an effortless and engaging read. This book and its sequels, Man of the Family (1951), The Home Ranch (1956), Mary Emma & Company (1961), The Fields of Home (1953), Shaking the Nickel Bush (1962), The Dry Divide (1963) and Horse of a Different Color (1968), were the result of a creative writing course taken by Ralph Moody at the age of 50, and are composite portraits of events and characters from his childhood and later years. These books are beloved of many “religious-minded” homeschoolers, for their emphasis on moral fortitude and godly behaviour. Though Ralph fell aside from the narrow way many times, he was always able to boost himself back up by his bootstraps, with the help of an occasional inspirational visit to the back of the barn with Dad and a willow switch, or a less-physically-painful session with Mother and the family Bible. Fair enough. Mostly very good, this book, and perhaps I am being overly critical regarding all of the corporal punishment the author so enthusiastically reports. 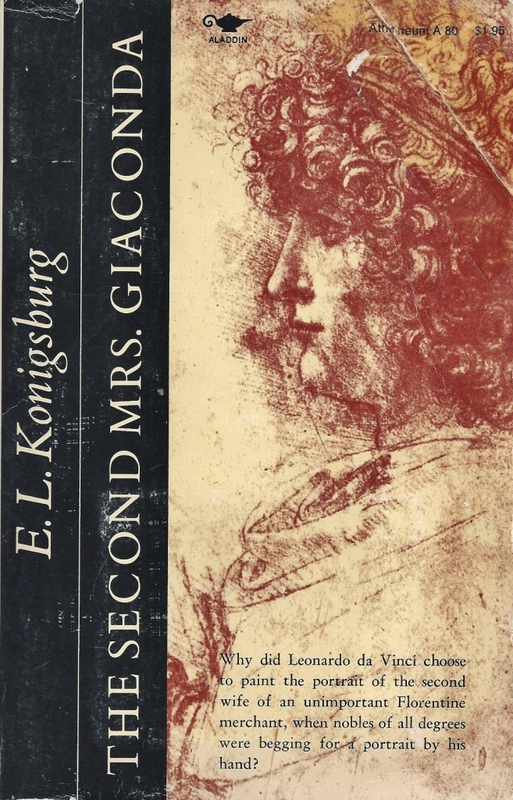 The Second Mrs. Giaconda by E.L. Konigsburg ~ 1975. This edition: Aladdin, 1980. Softcover. ISBN: 0-689-70450-X. 138 pages. Why did Leonardo da Vinci choose to paint the portrait of the second wife of an unimportant Florentine merchant, when nobles of all degrees were begging for a portrait by his hand? Great question, regarding the enigmatic “Mona Lisa.” Too bad the author never really answers it. I quite like a lot of Elaine Lobl Konigsburg’s work, for though she was of the “problem novel” school of juvenile writer, her books for the most part contain a lot of humour, and are never preachy. The “educational” bits are generally unobtrusively incorporated into the tale, with the final product being entirely pleasing. Sadly, The Second Mrs. Giaconda, despite its perennial inclusion on juvenile reading lists due to its Leonardo da Vinci theme, is to my mind something of a dud, being written exclusively in “tell, don’t show” mode. A great shame, because this writer was capable of doing so much more, and the subject is chock full of potential. The novel gives an overview of life in Renaissance Italy through the eyes of Leonardo da Vinci’s young apprentice Gian Giacomo de’ Caprotti, known to his familiars as Salai. Giacomo/Salai was a real historical personage, and he is mentioned in da Vinci’s journals with intriguing frequency, from his entry into the household as a child of 10, in 1490, to his inclusion as a beneficiary of a house and half of da Vinci’s garden property in da Vinci’s will. Leonardo da Vinci refers to Salai as a “liar, thief, mule-head, glutton”, and includes mention of his apprentice’s numerous failings, but obviously something happens during their time together to turn the tables completely. What was it? Konigsburg fabricates her version of their joint story referring to da Vinci’s actual journal entries, and in this case her creative license feels forced, as she incorporates Salai’s fancied involvement in all of da Vinci’s personal and professional relationships, in particular with Leonardo’s great patron, the immensely powerful Duke of Milan, and his wife Beatrice d’Este. None of this has anything to do with the Mona Lisa, and the “second Mrs Giaconda” shows up only very briefly in the very last chapter, with her portrait painted as something of a slap in the face to Beatrice’s jealous sister Isabella, and the whole project completely engineered by the cunning Salai. The son of a poor shoemaker, Salai is a cutpurse caught in the act by the master, whose grasp and visage he mistakes for the hand and face of God. Leonardo takes him as an apprentice, at no fee, and practically as a servant. Salai remains a scoundrel who moves from petty theft to selling his master’s sketches, and later to selling his audiences. Princess Beatrice comes to Milan and marries Il Moro, the duke, who had hoped to marry her beautiful older sister Isabella d’Este. He continues to wait on his beautiful mistress Cecilia Gallerani, the subject of a Da Vinci portrait that is already famous. “She’s small and dark and perfectly plain”, Salai says when he first sees Beatrice; when they meet by accident, she is “trying to get the sun to make me blond and beautiful”. They discover a shared taste for mischief. To Leonardo she laments, “Could I but gain my husband’s love, I know that I could disguise this plain brown wrapping.” He asks what she has “to give him that Cecilia has not” and she volunteers her “sense of fun”. Beatrice grows into a political role and becomes a collector of clothing, jewels, etc., and no longer a companion to Salai. She [eventually] conveys insight regarding the master’s talent, and admonishes Salai to take some responsibility for that. To achieve great art, Leonardo needs “something wild, something irresponsible in his work”, and Salai must help. …and the rest, as they say, is history. If it all seems a bit flat, despite its convolutions, it is, especially as reported by Konigsburg. I thought this little historical fiction highly contrived and not particularly interesting, despite its achievement of the Best Book of the Year (1975) for Young Adults Award from the American Library Association. *All of the quotations in the Wikipedia excerpt are taken from Konigburg’s novel, not Leonardo’s journal.